I Canna Believe It’s You! 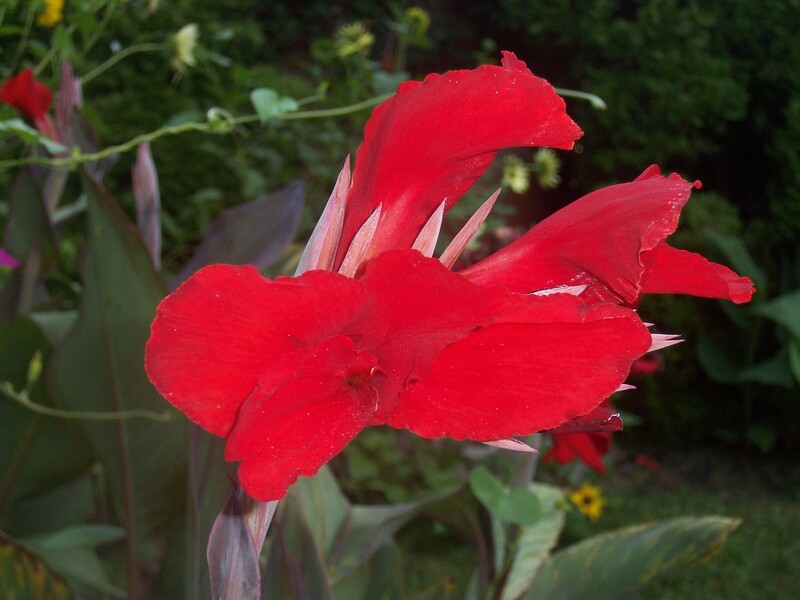 For this demonstration, I’ll use my absolute most favorite Canna, “Black Knight.” The leaves are big and bold and bronzy red, with hot red blooms. And the rhizomes, well, they’re meaty. That’s right. Meaty. 1. First, be prepared to get dirty. I first shake and brush off all of the excess dirt and peat moss. Remember, when these were dug up in the fall, the soil was not washed off. 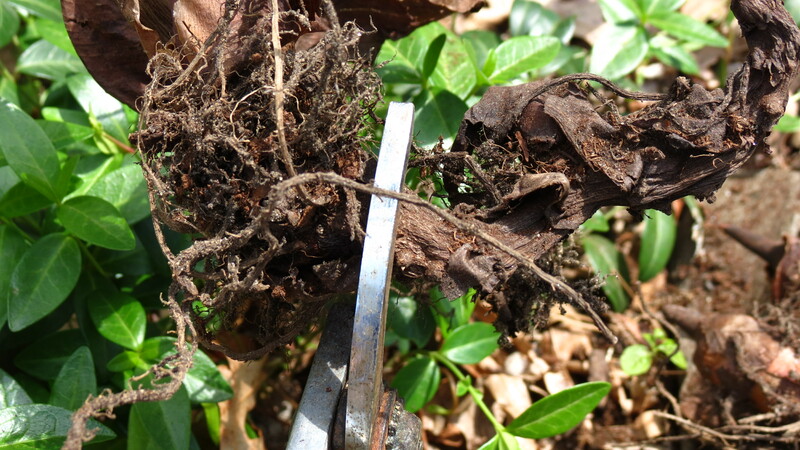 Once cleaned, you can see the structure of the rhizome and the previous year’s growth. Now, it’s time to take a good look and decide what stays and what goes. 2. 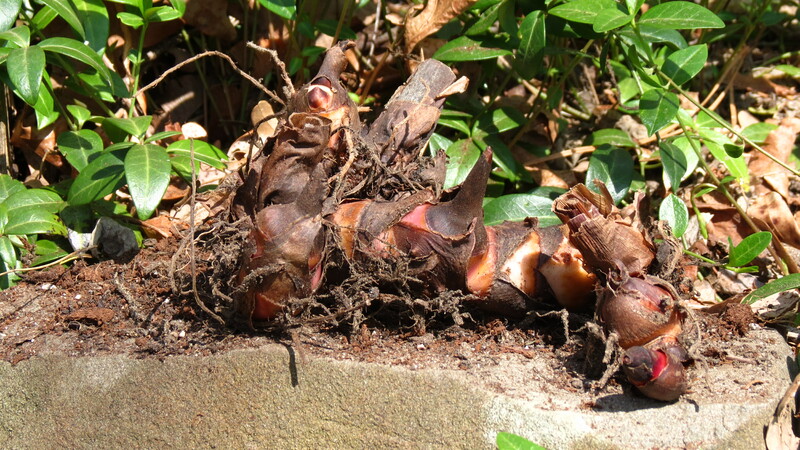 As the rhizome grows, segments become very dry and woody. These can be cut off. Actually, some of these areas will naturally want to be removed from the healthier tissue of the rhizome, and can be manually separated. 3. 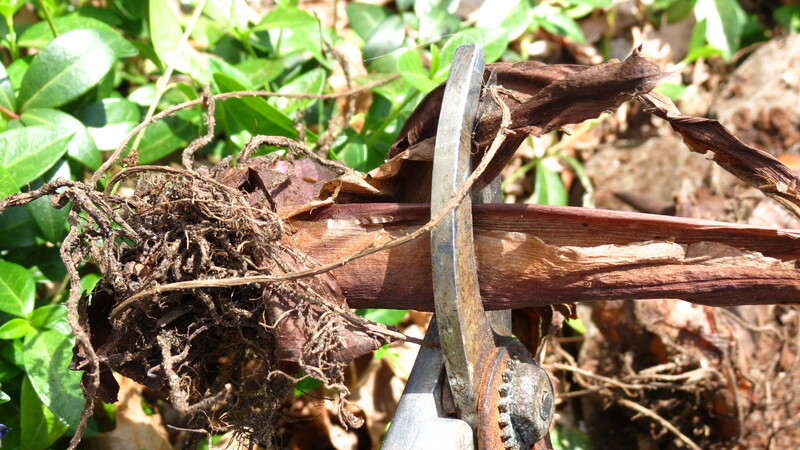 I then clip off last year’s stalk. That “eye” will no longer sprout. Instead, I am more interested in the fuller eyes, which have a warmer color tone. 4. 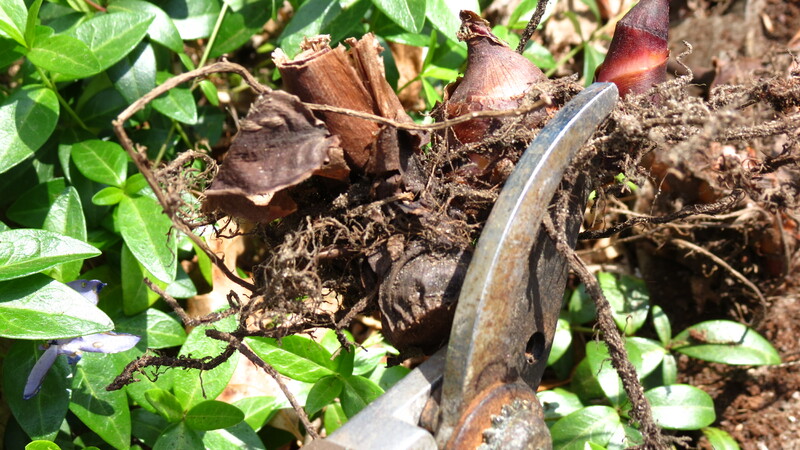 Finally, it’s time to snip off last year’s roots. Their work is done. 5. 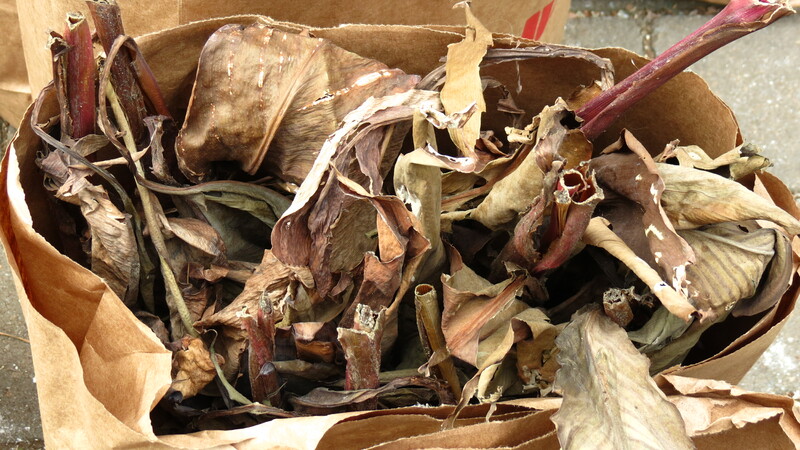 This leaves me with a firm, plump rhizome – ready to be planted. I hope you can see not only the warm color tone, but also the meatiness of “Black Knight.” Eventually, these knights will be the kings of the garden. 6. Just like with Elephant Ears, I use a potting system. This gives me greater control to protect the rhizomes from any freeze, and also to make sure that those that don’t sprout won’t leave a gaping hole in the garden. 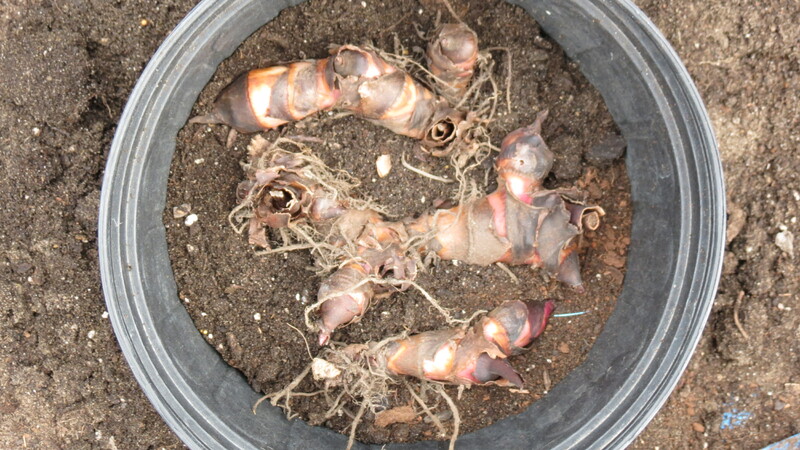 The rhizomes are covered with about a ½ inch of soil. I do tend to pack them into pots – I’m not sure why. Maybe it’s a lack of space. 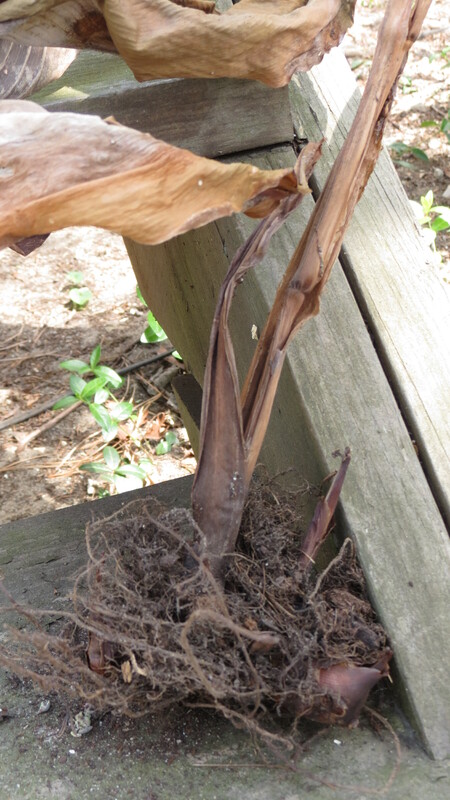 I just don’t have room — or a pot — for every rhizome. But I like to think that I’m creating a ready-made clump when it’s time to add them into the garden. 7. And what will these rhizomes grow to be? Next Post: Spread the word! Nitty Gritty Dirt Man is turning one, and in honor of the occasion I’m conducting my first giveaway. Details will be revealed in a few days! Great tips for Canna’s. I never grow them. After seeing that picture of the beautiful red one I am tempted to try one. I completely recommend it. They will make you feel like you’re in the tropics! You’re right they do look very tropical but unfortunately wouldn’t suit my style of garden at all but it is nice to appreciate them in someone elses garden. That’s probably the beauty of gardening — or at least another beauty of gardening — the ability to share and appreciate the work that each one of us puts into his or her landscape. Another funny title, great tips and FABULOUS flower! Wow! That red is stunning. I’ll see if I can find that canna around here. It may go by other names — but the leaves are reddish and the flowers are red hot. You may want to try the others as well: pink blooms, yellow blooms, striped leaves. . . There’s a lot from which to choose. Kevin, you make the storage and the uncorking look easy. It may be for you, but that’s due to your talent and love of rhizomes. Well done. What do you do to keep critters away when you overwinter them? Mice seem to always find there way into mine! Actually, I’ve never had a problem with mice. The cement under where they are stored is actually a bit of a crawl space, hidden behind a closet. I’m told that when the house was first built, the bunker was supposed to be a bomb shelter — it was the height of the Cold War. If they were in my shed, it would be a different story. You make me happy I can leave my cannas in the ground! You really do a great job with yours. I have very few plants I must dig and store, because I’m rather lazy and undisciplined. 🙂 Glad you can be happy at my blood, sweat and tear. 🙂 It’s a chore — and I often wonder why I do it — and then I see the pay-off. I tried over wintering dahlias in the garage this year just to see what would happen (extra dahlias, not my good ones!) and had the same mushy experience. Straight into the compost bin. A good storage spot is essential. Hi Marguerite. And let’s not forget the smell that goes along with the mush! In our climate, it’s definitely all about the storage.